I recently claimed that the cooking gets more laid back in the summer. For some reason, after posting that, I’ve cranked the game up a notch instead. Perhaps it would be more correct to say that the dishes get lighter. Roast and gravy isn’t too compelling when it’s hot and sunny outside I guess. Today’s dish is pasta based, as opposed to the last post which had som pasta chucked in as a filler. 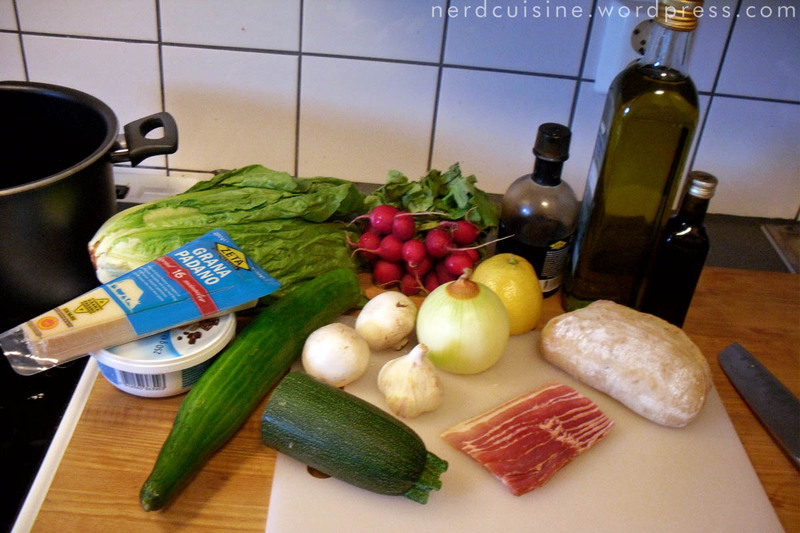 It’s also meant to do away with some leftovers and try out a couple of new things. As you can see, today’s lineup is filled to the brim with good stuff! Romaine lettuce, Grana Padano cheese, mascarpone, cucumber, half forgotten radishes, mushrooms, fresh garlic, leftover zucchini, balsamic vinegar, leftover lemon, onion, bacon, olive oil, truffle oil and a nice sourdough roll. Again, me and the little cherry red camera haven’t quite agreed on how indoor photography without flash is best carried out. 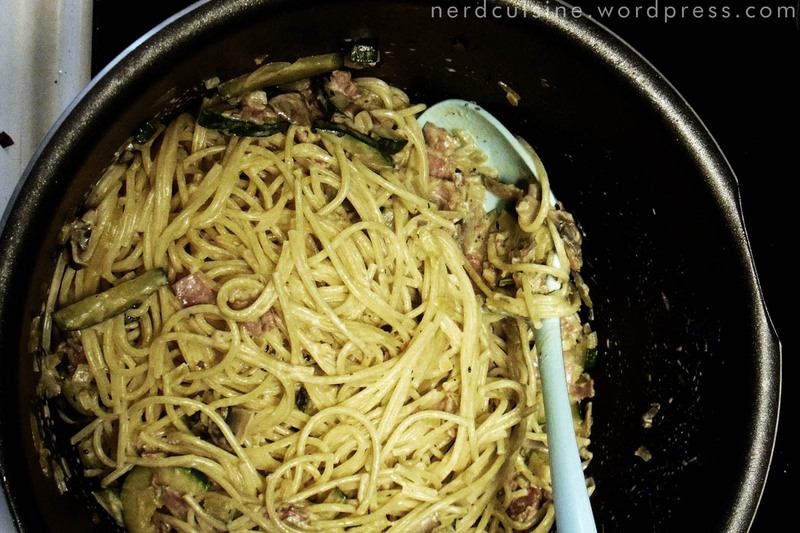 And as usual, I forgot to include the pasta in the lineup, but I believe that since I don’t give much directions anyway, people actually replicating my dishes will be able to figure out how to cook spaghetti anyway. 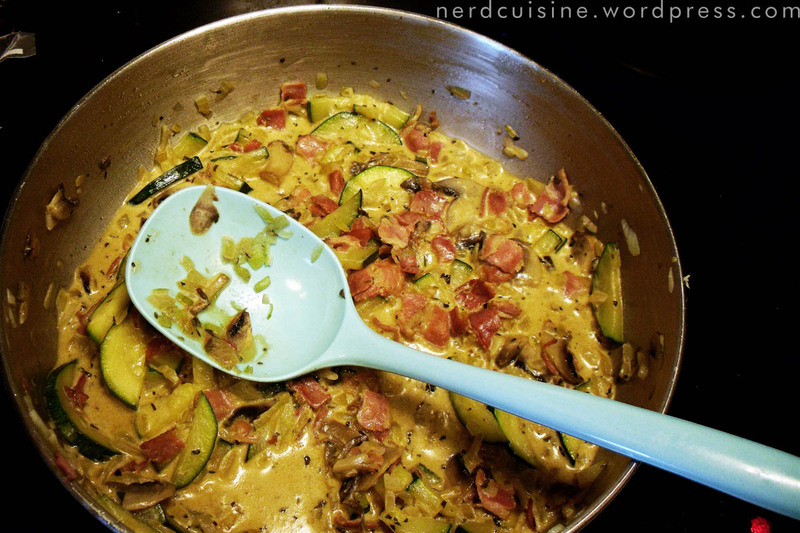 Once that looks nice, add mushrooms, garlic, onions and bacon to the pan. 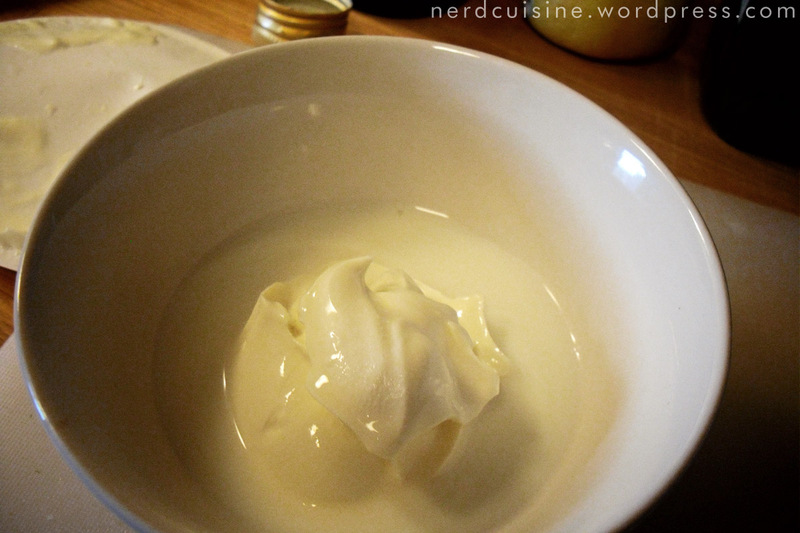 Normally, one would use cream, crème fraîche or roux/milk for sauce, but I decided to try mascarpone, which is usually associated with desserts. Since it’s fat fatty fat fat (40%) I’m taking it down a notch with the double amount milk. 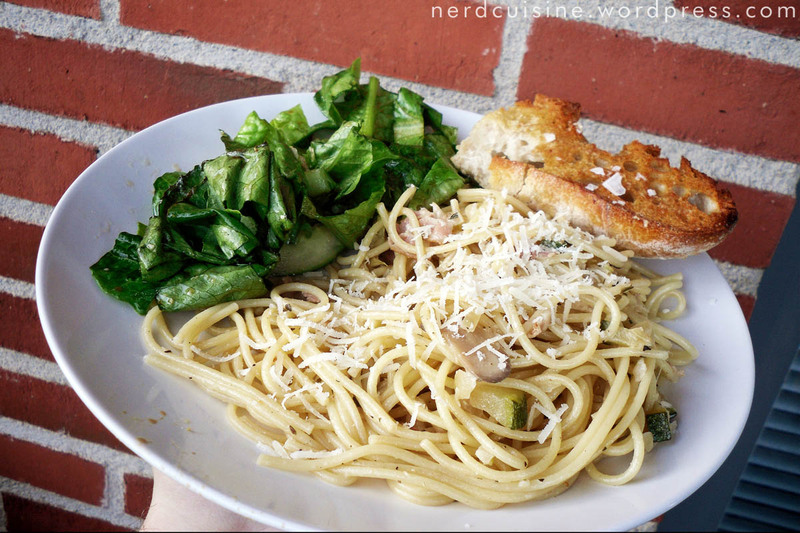 If you haven’t started boiling pasta and toasting bread it’s time to get that going. The amount of fluids is intentionally a bit on the low side, since I feared dumping a whole lot of mascarpone in a dinner would make it heavy and greasy. Some herbs and a swig of wine doesn’t hurt, but since I had no wine, I added a splash of balsamic instead. 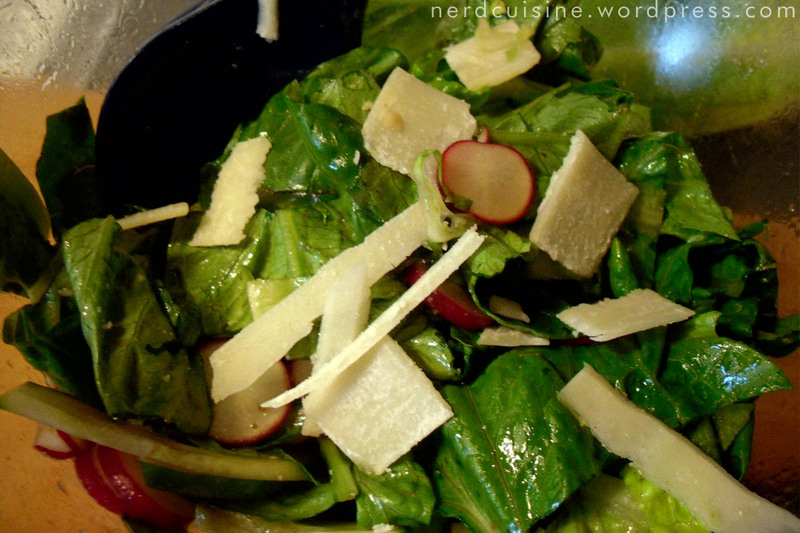 Simple salad with lettuce, cucumber, radishes and cheese flakes. The intricacy is in the vinaigrette. Oil, vinegar, salt and pepper as usual, but with as much lemon juice as vinegar and a few drops of truffle oil, which takes things to another level entirely. Assemble dish in spaghetti pot. I usually add considerable amounts of black pepper at this point. After initial toasting, the roll had a drizzle of oil, a rub of garlic and a short trip to the oven to take some of the raw edge off the garlic. 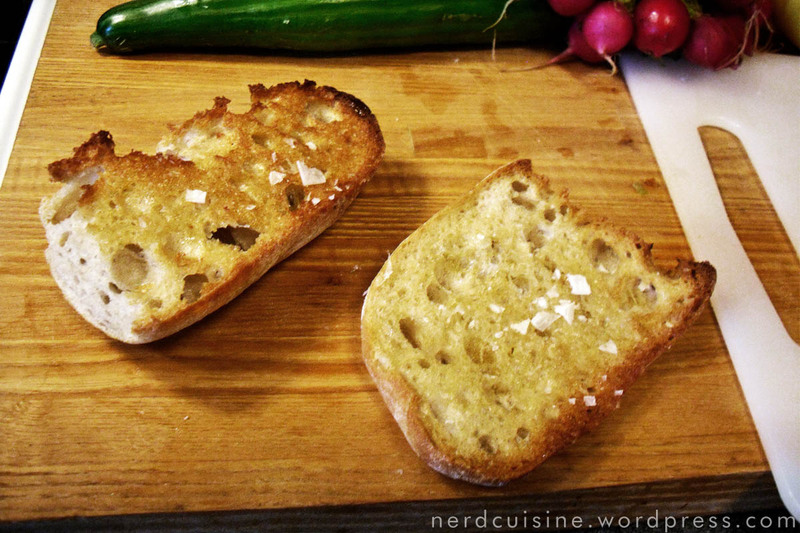 Remove from oven, add salt and call it bruschetta. Today’s plated dish shot is brought to you by the balcony. This recipe isn’t really complicated enough to warrant nine images, but it can still be simplified further. I’d imagine that it’s very tasty even without bacon for example. Those who really like salad could instead make that part more complicated by adding more stuff, but that’s rather obvious. To conclude, I’d say the mascarpone works quite well in this dish. 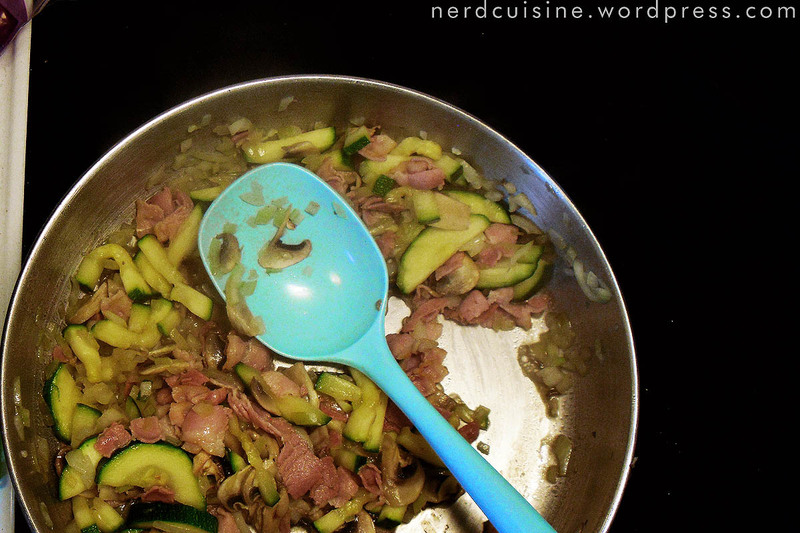 Its slight sweetness compliments that of the onions and zucchini, while offering a nice contrast to the salty bacon. Next time, I’m hopefully doing fresh fish. 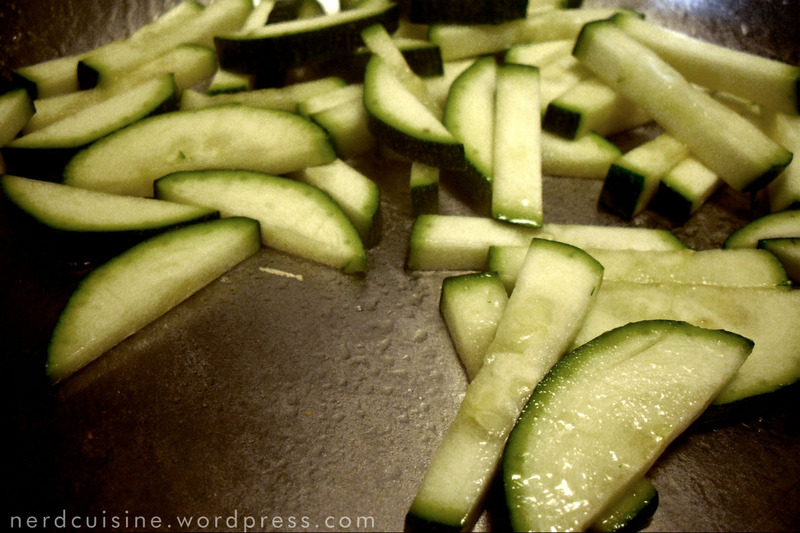 This entry was posted on June 29, 2012 at 13:54 and is filed under bacon, bread, cheese, italian, leftovers, mushroom, pasta, salad, side dish with tags dinner. You can follow any responses to this entry through the RSS 2.0 feed. You can leave a response, or trackback from your own site.